Are capital controls the answer? Given I am currently in Washington DC, I thought a local story would be appropriate for today’s blog. In February 2010, the IMF published a Staff Paper which reversed its long-standing position on capital controls. Staring at the hard evidence that nations, which had imposed constraints on surging capital inflows to attenuate the negative economic impacts, fared better in the recent global financial crisis, the IMF has acknowledged that their previous position based on free trade back by total liberalisation of cross-border financial flows was unsustainable. They now argue that controls on capital inflows can be effective if well designed and safeguard an economy from the costs of speculative attacks. Some progressives are calling this a revolution. I am less convinced. From a Modern Monetary Theory (MMT) perspective, I would solve the problem by placing total bans on speculative flows that do not back real production (for example, that reduce foreign exchange exposure in cross-border trade). But this is another example of the zealous position that has been long-advocated and implemented by the IMF has failed to safeguard national economies from the destructive forces released by the increasing financialisation of the global economy. On February 19, 2010, the IMF issued a Staff Position Note (SPN/10/04) entitled – Capital Inflows: The Role of Controls. The standard IMF position on capital controls is outlined in this 2000 Report – Capital Controls: Country Experiences with Their Use and Liberalization. When we talk of capital controls we are considering policies that “restrict the free movement of capital” – which can be imposed on “movements of capital entering (inflows) and exiting (outflows)” a country. They are mostly used to “limit the downward pressure” on the currency and “to counter speculative flows that threaten to undermine the stability of the exchange rate and deplete foreign exchange reserves”. Economists claim that capital controls “help reconcile conflicting policy objectives when their exchange rate is fixed or heavily managed” which allows the central bank to run an autonomous monetary policy targeting inflation. The IMF also considers nations employ capital controls “to support policies of financial repression to provide cheap financing for government budgets and priority sectors”. There are broadly two types of capital controls used: (a) “administrative or direct controls” – which just impose limits or bans on capital flows; and (b) “market-based” controls impose extra costs on capital flows which reduce the incentives to shift funds across national borders. The standard IMF line was restated emphatically less than 3 years ago on July 28, 2007. Place: Bangkok. Occasion: A speech by Rodrigo de Rato, IMF Managing Director entitled Capital Flows in an Interconnected World. This speech was given just before the escalation of the financial crisis. Financial globalization, measured by the sum of gross external assets and liabilities as a share of GDP, has increased threefold since the mid-1970s, and has accelerated since the mid-1990s. By 2004, the average sum of external assets and liabilities was more than 100 percent of GDP in low-income countries, more than 1½ times GDP in middle-income countries, and more than 5½ times GDP in high-income countries. Financial globalization has been associated with a wide range of benefits, including to businesses and citizens in Asia. It has given businesses access to a much broader market for savings and has lowered their cost of capital. Higher foreign direct investment has the potential to accelerate technology transfer, improve productivity, and provide greater employment opportunities. And increasingly—returning to my first point—financial globalization is giving Asia’s savers access to a wider pool of investments, and the opportunity to diversify risks across borders. In addition, financial globalization can play a catalytic role in encouraging development of capital markets and financial sectors, improving the quality of institutions, and promoting the adoption of stronger macroeconomic frameworks. Financial globalization can have many benefits, and policies directed to it should be careful to preserve these benefits. While upbeat he did acknowledge the risks arising from these trends and said that “countries which are the recipients of large capital inflows can protect their economies from the consequences of market disruptions”. How? First, by employing “good macroeconomic policies, and especially exchange rate flexibility” to allow monetary policy to target inflation more closely (with passive fiscal policy). Second, he said that “managing capital inflows … especially where inflows of capital appear to be a short-term surge” may have a role but did not go into detail. Third, nations should be “more liberal on capital outflows”. Fourth, “such liberalization” should be accompanied by “domestic financial market development” which can mitigate the “problems of capital inflows”. So “sound macroeconomic policies, and more open trade systems” are all advantageous according to this IMF official. So typical IMF dogma – liberalisation (deregulation) accompanied by tight fiscal policy and an inflation targeting monetary policy stance. This is the policy cocktail that set the World up for the most recent crisis. … they are unlikely to do so for very long, and they also have important disadvantages. They tend to set central banks and private financial institutions against each other. And since private institutions are generally imaginative and well resourced, they generally find ways around the restrictions, often very quickly. Indeed, recent studies conclude that capital controls rapidly become ineffective after their imposition. Capital controls can also create distortions in the behavior of firms and individuals, and when imposed on short-term flows they can cause particular problems for companies that cannot get long-term finance—usually small businesses and start-up firms. Once again standard IMF dogma that led the World financial system to its Waterloo. On February 19, 2010 that position changed – somewhat. The IMF sought to analyse the effects of capital controls used by various countries including Brazil, Chile, and Malaysia. These controls included explicit taxes on capital inflows, rules that demanded that a proportion of capital inflow be deposited interest-free with the central bank, and other prohibitions aimed to stifle foreign lending. In the world of economics and finance, revolutions occur rarely and are often detected only in hindsight. But what happened on February 19 can safely be called the end of an era in global finance. On that day, the International Monetary Fund published a policy note that reversed its long-held position on capital controls. Taxes and other restrictions on capital inflows, the IMF’s economists wrote, can be helpful, and they constitute a “legitimate part” of policymakers’ toolkit. So February’s policy note is a stunning reversal – as close as an institution can come to recanting without saying, “Sorry, we messed up.” But it parallels a general shift in economists’ opinion. It is telling, for example, that Simon Johnson, the IMF’s chief economist during 2007-2008, has turned into one of the most ardent supporters of strict controls on domestic and international finance. The IMF argues that capital inflow surges compromise sound macroeconomic management – by pushing the exchange rate up and undermining trade competitiveness. They also acknowledge that “large capital inflows may lead to excessive foreign borrowing and foreign currency exposure, possibly fueling domestic credit booms (especially foreign-exchange denominated lending) and asset bubbles (with significant adverse effects in the case of a sudden reversal)”. 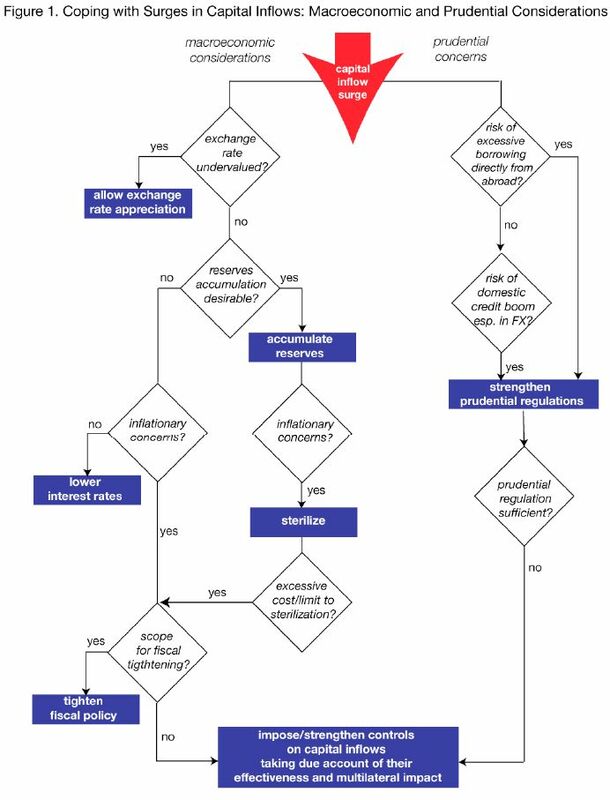 To help a nation decide whether capital controls are justified they produced the following flowchart – which separates the macroeconomic issues from the financial fragility considerations. In both situations, the conclusion they reach is that capital inflow restrictions are justified and effective in certain instances. The IMF Staff Note also acknowledges that the “composition of inflows” is important. Nations with large concentrations of foreign direct investment in the financial sector suffered worse in the crisis because they imposed higher debt growth given a lot of these flows are facilitated by loans to local banks via their foreign head office bank. Restricting this sort of financial inflow was considered to be beneficial to the nation. The IMF’s policy note makes clear that controls on cross-border financial flows can be not only desirable, but also effective. This is important, because the traditional argument of last resort against capital controls has been that they could not be made to stick. Financial markets would always outsmart the policymakers. Even if true, evading the controls requires incurring additional costs to move funds in and out of a country – which is precisely what the controls aim to achieve. Otherwise, why would investors and speculators cry bloody murder whenever capital controls are mentioned as a possibility? If they really couldn’t care less, then they shouldn’t care at all. I agree mostly with him on the change of heart by the IMF. But while he considers it represents a major shift in their policy position and the “IMF should now get to work on developing guidelines on what kind of controls work best and under what circumstances” I do not see the IMF changing its overall liberalisation stance anytime soon. Clearly, the IMF is being forced by the crisis to reconsider its hardline position which failed to provide predictive capacity to any nations. Their constant ideological support for liberalisation was a contributing factor to the crisis. The nations that followed their advice to the letter suffered more. That is now clear. But what it implies about the organisation of international financial markets is beyond what the IMF will ever contemplate. In this context, I do not think that the imposition of country-by-country capital controls is the best way to eliminate the destructive macroeconomic impacts of rapid inflows or withdrawals of financial capital. If we consider that the only productive role of the financial markets is to advance the social welfare of the citizens – that is, advancing public purpose – then it is likely that a whole range of financial transactions, which drive cross-border capital flows, should be made illegal. Capital inflows that manifest as FDI in productive infrastructure are relatively unproblematic. They create employment and physical augmentation of productive capacity which becomes geographically immobile. However, financial flows that are speculative (especially short-term flows) and not connected with the real economy are unproductive and should be declared illegal. You may consider this is an extreme direct control. However the policy should be introduced on a multi-lateral basis spanning all nations rather than being imposed on a country-by-country basis. The large first-world nations should take the lead. I don’t see that leadership being forthcoming. Local banks should play no role in facilitating the entry of speculative short-term flows. In this context, the only useful thing a bank should do is to faciliate a payments system and provide loans to credit-worthy customers. First, they should only be permitted to lend directly to borrowers. All loans would have to be shown and kept on their balance sheets. This would stop all third-party commission deals, which might involve banks acting as “brokers” and on-selling loans or other financial assets for profit. It is in this area of banking that the current financial crisis has emerged and it is costly and difficult to regulate. Banks should go back to what they were. Second, banks should not be allowed to accept any financial asset as collateral to support loans. The collateral should be the estimated value of the income stream on the asset for which the loan is being advanced. This will force banks to appraise the credit risk more fully. Third, banks should be prevented from having “off-balance sheet” assets, such as finance company arms which can evade regulation. Fourth, banks should never be allowed to trade in credit default insurance. This is related to whom should price risk. Fifth, banks should be restricted to the facilitation of loans and not engage in any other commercial activity. Please read my blogs – Operational design arising from modern monetary theory and Asset bubbles and the conduct of banks – for more discussion of financial sector reforms. 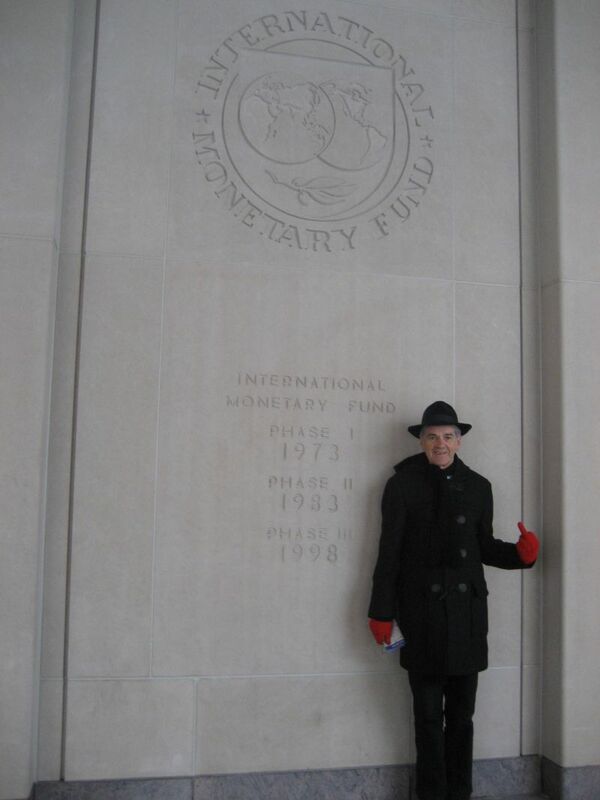 And finally, and in keeping with the local theme, here is a photo of me (in 2008) paying my respects to the IMF (right click and select see Image to enlarge and see more detail). I was actually offering tourist services to the Fund – see my pointer – showing tourists what building they were standing in front of! (-:! The Fiscal Sustainability Teach-In and Counter-Conference will be staged in Washington D.C. tomorrow (April 28, 2010) and details of venues and other relevant arrangements are available at the home page. All are welcome. If you are near to Washington DC and have the means it would be great to see you at the conference. This is a shoe-string, community-driven event being organised by committed volunteers who are motivated by the fact that they care and realise something is wrong with the dominance of conservative, free-market think tanks like the Peter G Peterson Foundation in the public debate. They deserve our support. Tomorrow I will report on the Teach-In. Capital controls on inflows are totally unnecessary. If the exchange rate becomes overvalued, printing more money is the obvious solution. If the government has previously created money by lending it to itself, all it has to do is cancel a bit of its own debt. There’s always scope for fiscal tightening in the form of raising taxes. And if prudential regulation is insufficient after strengthening, they should strengthen it more. The five changes you’ve identified would more than suffice. Brrrrr, it looks cold over there from the picture. I like the comedy with the gesture to the IMF in the picture! Have fun and keep safe. Timed to nicely coincide with the Peterson Deficit Terrorist Love Fest in our Capitol, Democratic (!!!) House Majority Leader Steny Hoyer ventures all the way to Rupert Murdoch’s Wall Street Journal to prove his neoliberal bona fides. Fortunately, Hoyer is a man of few words, for who wants to spend a long time reading that the spending spree stopped on Wall Street and now it’s time to pay for it on Main Street. As for the payments system for fiat (including risk-free storage), the monetary sovereign is the ONLY proper institution to provide that service and it should make no loans and pay no interest.